Buddy Holly's song "Everyday" came up on Pandora while I was at work today. Every time I hear that song I immediately see daffodils in my head and it makes me so happy. It's all because of this scene from my favorite movie, Big Fish. It's sort of embarrassing how many times I've seen that movie. I think I was confused by it at first, so I kept watching it over and over so that I could make sense of the plot. Then it sort of became my comfort movie and I'd watch it when I was sick or having a bad day. Since it was my favorite movie I thought it was unacceptable if my friends hadn't seen it, like they wouldn't understand me if they didn't know about this movie, so I'd watch it again with each of them.....and now I can just quote the whole thing. Seriously. Watch it. I'm thankful that I finally found a white shirt to wear to Lexie's wedding Saturday! Who knew it would be so hard? Maybe I'm just a picky shopper. Either way, Downeast ended up pulling through for me, which I wasn't expecting. I think I was the only person who didn't own a white shirt -- they are too high maintenance. Trying to keep them as white as when you bought them. They start to look old really fast and I don't like that look. But now I officially own a white shirt. I'm accepting the responsibility. I'm growing up. 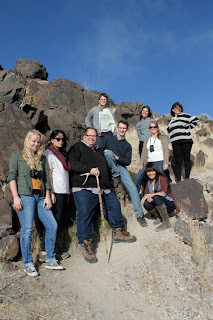 Wednesday, I got to go with my professor (the curator of contemporary art at BYU's MOA) Jeff Lambson, 5 other art students, as well as Mark Magelby and his wife Julie to the Spiral Jetty with artist Oliver Herring. We were all piled in a 12 passenger van and drove to SLC first to pick Oliver up from the airport. I was turned around in the van talking to my friend Liz, then got sort of carsick and forced myself to sleep the rest of the way. 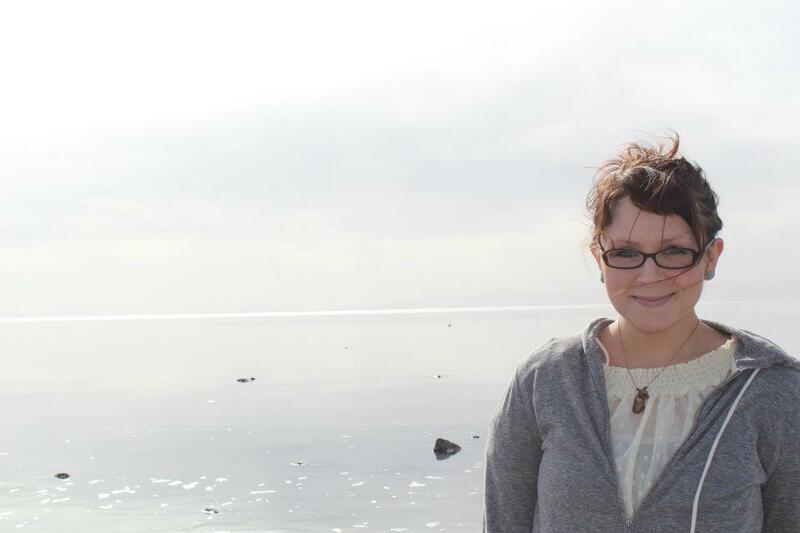 We stopped at the Golden Spike (where I woke up from my nap) then drove just a few more miles to the Spiral Jetty. The Jetty is an earthwork that artist Robert Smithson made on the edge of the Great Salt Lake in the early 70s. I've been wanting to see it since I was a junior in high school and am thrilled that I can cross that off of my bucket list. The Jetty was under about a foot of water, which made it hard to see. I climbed down to the water, found a beautiful stone (I have an ever growing collection of rocks that are in random bowls around my bedroom) and got sand in my moccasins. Then hiked back up to where I'd started and even further up this hill so that I could get a better view of the Jetty. Every once in a while the wind would stop for a second and a small cloud would pass underneath the sun so that the glare on the water would go away and I could see the 9 shape of the Jetty. We got a group picture and I got one with Oliver Herring. Oliver showed us how great random plants smelled when they were squished in your fingertips. Seeing the Spiral Jetty was a really spiritual experience for me, especially being there with people who value art as much, if not more, than I do. We stopped in Brigham City for dinner at the steakhouse Maddox. I got the lucky seat next to Oliver at dinner and looked crazy when I ordered the one meatless option on the menu: grilled cheese. The raspberry butter, homemade root beer, and coconut cream pie were to die for, so I can only imagine how wonderful the steak must have been. I was one of the last people to get back in the van after dinner and to my surprise, I got to share a row in the van with Oliver Herring. I've really looked up to him for a while, so I was really intimidated and nervous to talk to him the whole two hour drive home. We talked about grad school and different places to go (Hunter, Art Institute of Chicago, etc.) and he was full of amazing advice. But I just couldn't stop smiling. Which I think made him feel uncomfortable because he kept shooting these huge smiles my way that I could see even in our dark car. And those just made me smile even more. It was the same feeling that I had when I was in London with my artist friends. It's hard to explain what it's like being around art and other artists. Just peace and happiness. It was exactly what I needed. Mark Magelby. What a funny guy. I remember that his art history classes were way over my head, but I enjoyed going to his classes because his jokes made me laugh. Emily noticed during our dinner that I laughed at everything Mark said, whether he was making a joke or not. I just have in my mind that Mark is funny, so I find myself just laughing at everything. When we were getting in the car I laughed after one of Mark's comments. Emily turned to me and asked if I had thought that what Mark said was funny. And I honestly answered, "I don't know." I couldn't even remember what he had just said. Lol. Oliver Herring gave a three hour lecture Thursday in my seminar class. It held my attention the whole time (which is saying a lot about how wonderful he is). Some of his videos are so incredibly profound, and suprisingly hilarious at the same time. This piece was in the Mirror Mirror show in the MOA a couple years ago and it has stuck with me. It was nice to finally meet the artist and to have him show this piece to me again. I was literally inspired and laughing out loud the whole time. This morning was my first day of 3D Design. To make things better Brooklynn and Camilia are in my class. :) After a couple powerpoints we headed back to the welder so we could each practice welding and get a feel for it before we have to start our steel assignment. My professor walked over to the corner to cut a piece of metal. Sparks shot all over, which was expected. I think because my Dad is always doing stuff like that in our garage, and always has, (he usually asks you to hold something while those sparks are flying all over you) I didn't think anything of it. But Camilia really wasn't expecting it. She jumped back and immediately teared up. I stood there with Brooklynn laughing like true friends while she wiped tears off of her face. I would never expect someone to get so scared over that. She was caught off guard. It made my day. I'm thankful for other artists in my life who I can text 20 times during the day with art project ideas and they text back and tell me how terrible or amazing they are. It really helps. I had to run to the HFAC to sign a paper to get a key for my studio space. Except I forgot it was 11am on a Tuesday....which is the most irritating part of my week. Everything on campus shuts down for devotional (which I go to, on average, once a year). But I got there right as she was closing the door and she let me hurry and fill out the paper anyway, even though I go in that office way too often asking her annoying questions. Today in English we all sit down and John tells us all to pick a number between 1 and 17. There are 17 of us so we all really have to pay attention so we don't pick a number that's already been picked. He tells us that we're picking numbers and he's going to put them into a function to change the order and that will be the random order that we workshop our essays in. We all go around and each have our number. Then we find out that the function is (x-7)+6. Which is just subtracting 1 from each number...and that is the same order. LOL I couldn't get over how funny this was. Who knows why we picked numbers...it's not going to work at all. I was able to catch up in one of my classes today. Just one. But that's one less that I'll have to think about tomorrow. I really was there for exactly 101 days. Which makes me laugh for some reason. I wrote down what I did each of those 101 days, but unfortunately I was a terrible blogger over the last few months so none of those stories made it on here. I'm going to make a book out of my emails to go along with the two journals I wrote. I already miss it so much but I've had a pretty great time just hanging out at home this past week. I've seen friends, wrapped all of my presents, finished making presents, and getting ready for Christmas by putting lights up, decorating the tree and baking lots of cookies. I've also done a lot of things that I missed when I was in London, like driving and eating Mexican food. It does feel weird to not be taking pictures of myself having fun every day and constantly be on the go...but it's also very relieving. Going to London was probably the best decision I've ever made. Since I've been in London my blogging has been pretty rare and even when I post something it isn't really following the three themes of my blog. I was told in my Living Prophets class a couple semesters ago about how if we picked out experiences each day that 1. made us laugh, 2. we were thankful for, 3. were a tender mercy from the Lord; our attitude about life would be so much greater. So here is today. There is a sign for "Dorking" on the way to church. And the house next to it says, " ... Butts" and it makes me laugh every time. It's so great that they're right next to each other. My favorite part of today was sitting by Hillary in sacrament meeting. The High Councilman's talk was a little slow (but when I could focus it was really great....on tithing.) She turned to me and really quiet and serious said, "Is it okay if I tickle your back?" :) I couldn't help but laugh at her. She's too funny. She tickled my back and I think it helped both of us focus a little better. She's the best. My assignment for our group collaboration only took me like 5 minutes. I thought it would take a lot longer and it was nice to check it off of my list of things to do. The laundry room door wasn't locked (it's Sunday so I thought it might be) and my clothes didn't get fried in the dryer tonight. I'm thankful for the ward that I was assigned to here in London. I'm in the Peckham Ward and don't have any complaints! A lot of girls have to travel hours to their church meetings and have difficult callings. We leave an hour early, take the tube (which is usually pretty empty) to Elephant and Castle, and walk the rest of the way. It's been really nice weather every week and we take turns bringing cookies for the ride home. It's within our tube pass zone, so it doesn't cost me extra money either. I teach the YSA Sunday School class and they're all really great and comment a lot. Everyone is really happy and nice to us. There is one woman, Mary, who hugs me each Sunday and asks me how my week has been, which is nice too. I'm going to miss this ward when I get back to Provo. I switched the name of my blog. Eleanor Louise was the name of the goldfish that John gave me when I was 16 to ask me to Homecoming. I really loved the name and loved the fish, but it didn't even live that long and I figured it was time for a change. Plus it seemed weird posting under a name other than my own. My blog is now Alison Esther. Because I'm Alison Esther. This is a blog about things that make me laugh, tender mercies that I notice, things that I learn and things I'm thankful for each day.